The world of microscopy is a fascinating place and using digital technologies such as 3D profiling, are allowing us to analyze samples in ways that were extremely difficult and sometimes not possible in the past. I decided to get familiar with the Huvitz HRM300 series metallurgical microscope and its Panasis 3D profiling system software to see what could be done with this technology and how user friendly it is. 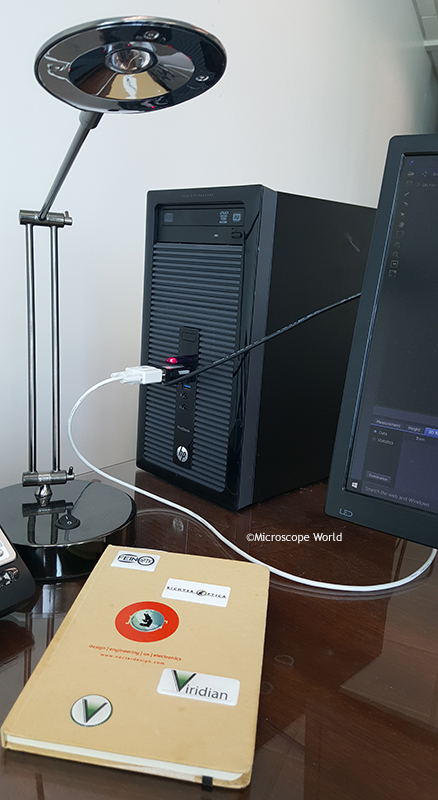 I used the LUSIS HC-20CU microscopy camera that is included with this package to capture images and video of a circuit board. 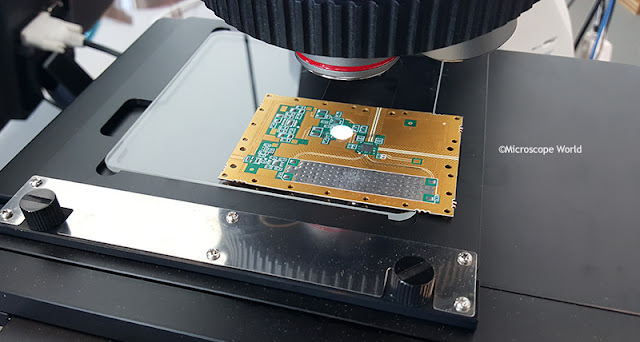 There were some basic configurations and a calibration that I needed to perform, but afterward, and with a little help from the manual's step-by-step instructions, I was ready to take an Extended Depth of Focus photo of the circuit board. Using the mechanical stage and viewing the live image on the monitor was simple enough and soon I found the area that I wanted to view. 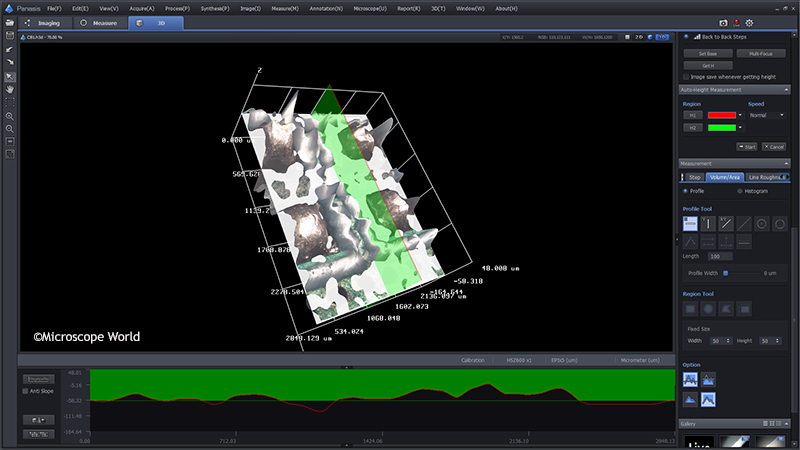 Under the 3D Profiler tab I set the top and bottom image reference points for the image and on the Extended Depth of Focus (EDF) tab I selected Auto and then entered the height intervals to be taken between image stacks. I then clicked Start and sat back while the profiler did its work. The Huvitz HRM-300 microscope's stage began to move between the top and bottom limits of the z-axis with a quiet motorized sound. A few seconds later a very detailed and crisp image of the circuit board appeared on the screen. I was impressed by the clarity of the image, but now it was time to see it in 3D. So I clicked on the 3D icon that appeared in the top right corner of the image and . 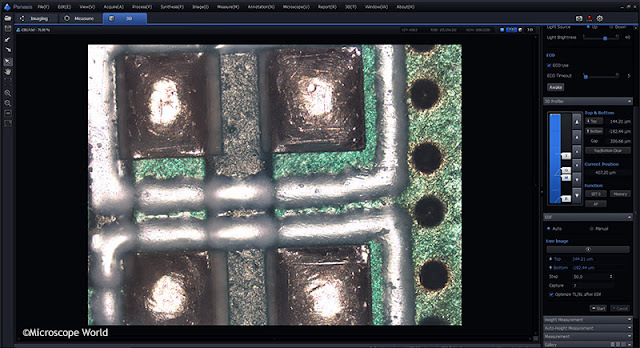 . .
3D Image of Circuit Board under the Microscope! The Panasis software allows for all types of measurements to be conducted so that the data and statistics needed are a few simple selections away. 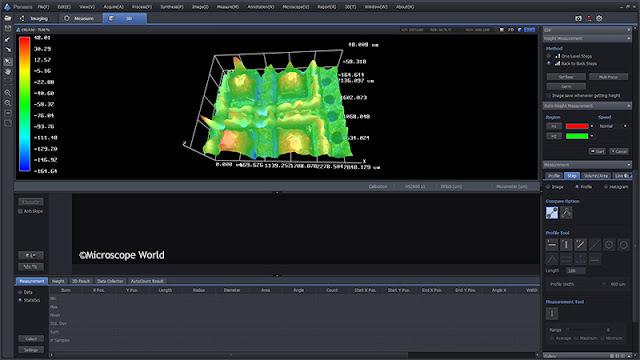 Image Texture Blending to help see sample's surface at designated ratios. Step Measurements & Lighting Enabled with Histogram for Convenient Surface Analysis. 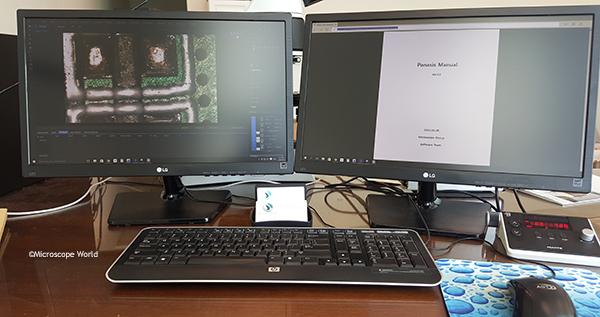 The overall user interface was pretty straight forward and the manual and other support options for the Huvitz HRM-300 series microscope, Panasis 3D profiling imaging software, and the camera made for a productive and user-friendly experience. 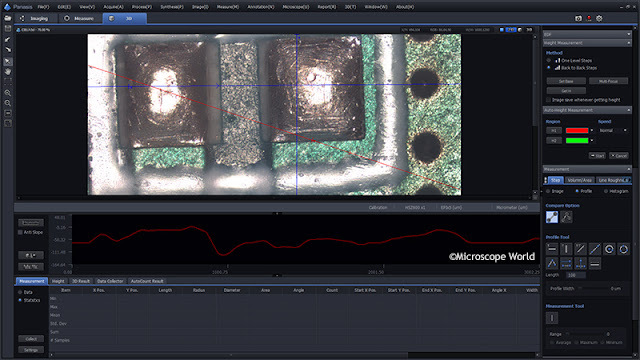 The ability to obtain wide panorama imaging of your sample, which greatly extends the microscope's field of view. Automatic optimized contestant lighting when observation magnifications are changed. Environment friendly functions that are good for both your microscope, the sample and the environment. The ECO setting goes into auto-power saving mode when you walk away from the system. Bulbs last longer and energy is saved. You can adjust the sleep mode time through the software. Additional options are available including a variety of objectives, a motorized nosepiece, motorized stage and reflected and transmitted illumination. 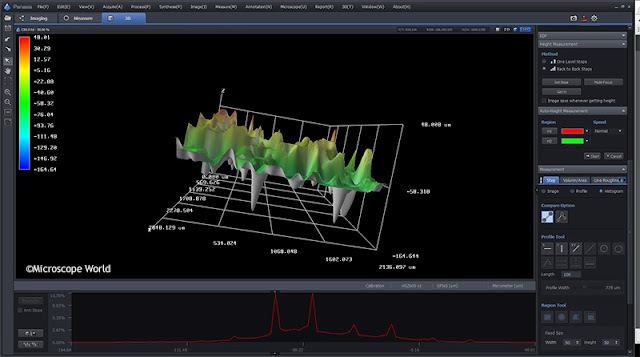 Do you have experience using the Huvitz HRM-300 3D Profiler Microscope? 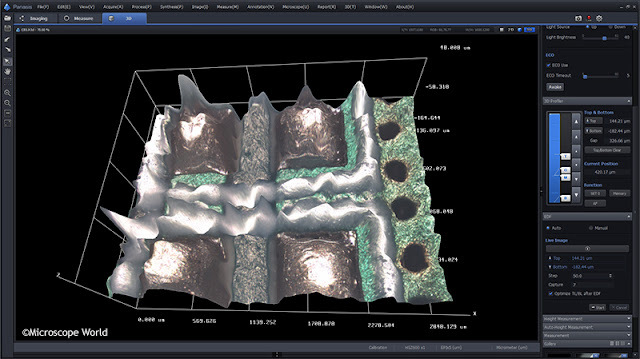 How has it worked for you and what are your thoughts on the 3D digital microscopy technology? 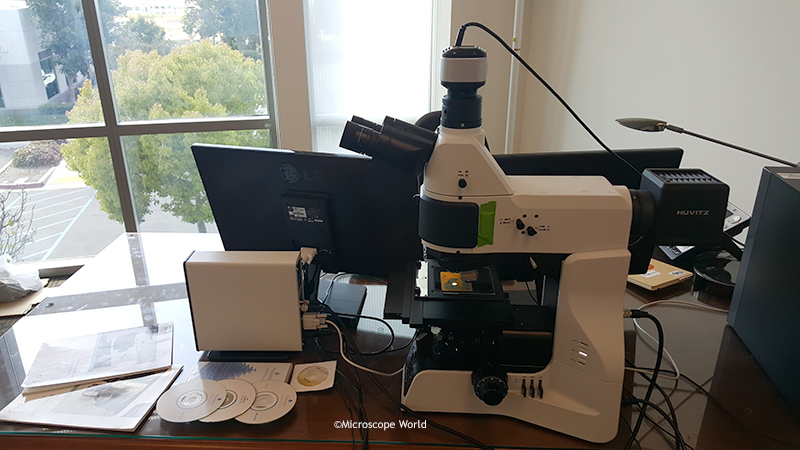 Microscope World would love to hear from you regarding with questions or comments on this microscope system. Contact Microscope World and ask specifically for microscopy specialist Sean Page. Stay tuned for more of Sean's adventures in microscopy at Microscope World.